There were several books from my childhood that affected my view on life and how I wanted my home to be when I grew up. One of them was a book titled Mandy, and anther was The Secret Garden. I have always wanted a space that was all mine. A space that maybe didn’t function as any thing other than a retreat and a place to image and dream. As a child I would run an extention cord to the linen closet and climb up the shelves to sit at the top and read. I also built many make shift forts on our property. But now as an adult, I have a much better place…..
Welcom to my secret Garden. This garden took almost 4 months to create. Not only do I have 4 small children, but I was at the mercy of mother nature. If it rained, I was out of luck that day. Also, I do a lot of my projects at night.This one however, could not be done at night. Plus, I had to built the fence on two sides. It was harder to get finished that any other “room” I have ever done. Let’s pan around and get a 360 degree tour, shall we? 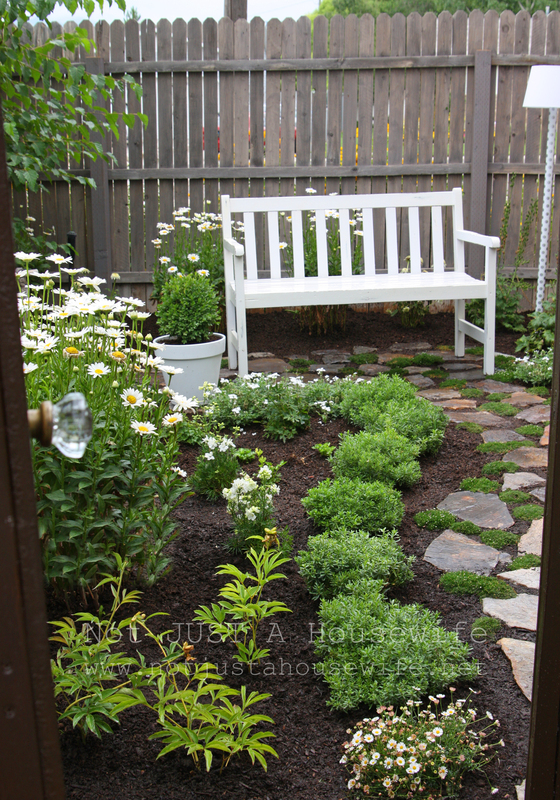 When you first open the door the flagstone path leads you to the bench. Next to the bench I have an outdoor solar powered lamp (tutorial coming soon!) and in the corner there is a trellis. I have white clematis growing there and I hope next year it climbs up even higher. Next to the trellis is one of my favorite thngs about the whole garden. My moss art! I LOVE moss so this seemed like the perfect fit for my space. This project started out a a big fat FAIL. I will tell the whole story and I will have the tutorial here in the next week or so. I showed the barnwood table already back when I had the drill giveaway. I love how it looks in here! 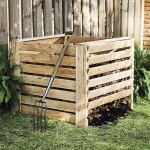 I used an old apple crate for all my gardening supplies. I love that not only is it functional, but super cute! Under the crate jasmine is growing. It smells amazing!!! There are also some big crystals we found when we moved here.I saved them knowing I would find special place for them. I collected rocks when Iwas growing up (maybe hoarded is a better word) so this is another nod to my childhood. On the otherside of the gate there is a planter box I mounted to the fence. You may remember me showing you some other planter boxes on the fence last year. This is just another way to hang them. 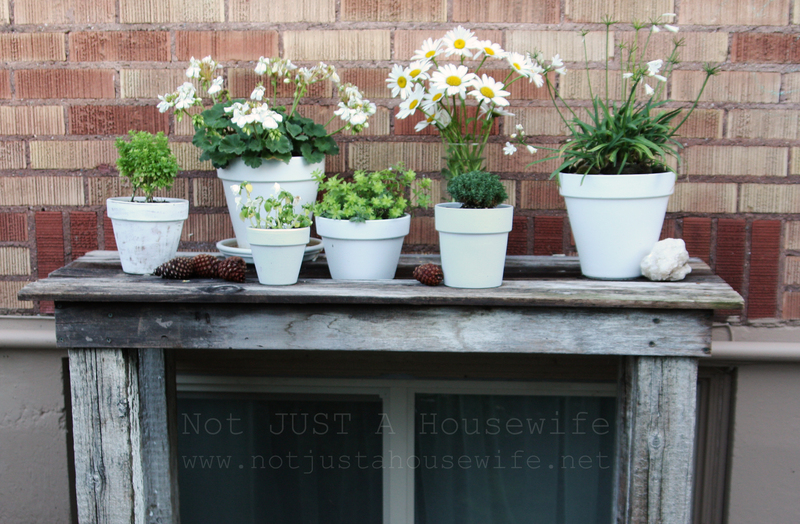 There is also the ladder from my Better Homes and Gardens photoshoot that I turned into a plant stand last year. I love this mirror! I got it for $15.00. I don’t think the pictures really cature the effect this mirror has on the space. It wasn’t until I hung the mirror that it felt like a room. This basket was a decoration at our wedding reception. It was filled with potted flowers. It is the only decoration from our wedding I have left. I love having it in here. And that brings up back to the bench! I want to show you a few shots from above. This is the view from my office window. Aren’t you jealous that this is what I get to look at whle I work??? Make sure and check back for all the tutorials that go with ll the projects in here fom the trellis to the moss art and solar powered lamp. Whoa, Stacy! This is seriously amazing! You are an evil genius, my dear. You just gave me about 5 projects I want to do NOW. Sadly, we learned our current house that we thought we’d be buying is no longer for sale and we have to move in the next 6 weeks. I will pin these projects for when my life settles back down. I even have moss ready for my own wall art! Dang you for sparking my imagination. Seriously, though, I absolutely love it and your toad is adorbs. Have you named him? It’s beautiful Stacy! What an enchanting space you’ve created! 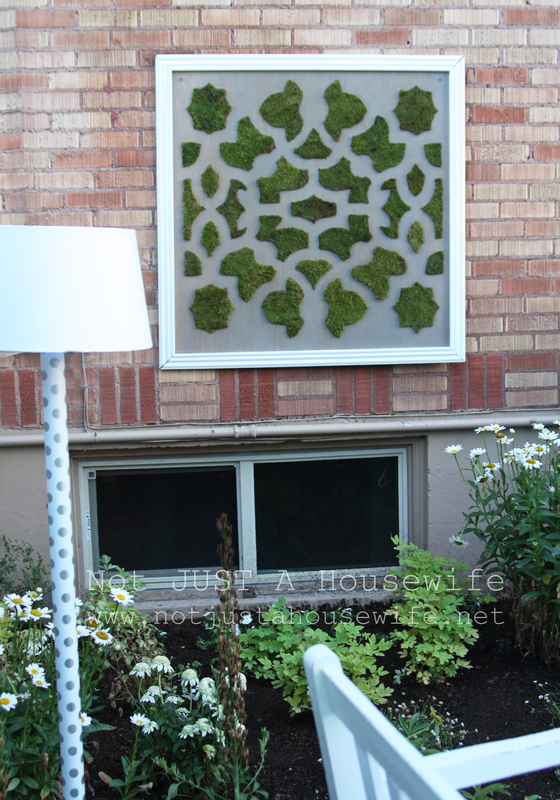 All the details (mirror, lamp, ladder, and art) make the garden extra special! this is a tremendous amount of work but soooo rewarding! i love the solar light idea & am looking forward to seeing how it’s done. Wow Stacy, everything looks amazing! What a beautiful retreat right in your own backyard! I am looking forward to your tutorials! Fabulous! Can you believe I only just read that book for the first time last week? Picked it up at a yard sale because I’d always wanted to read it but never got around to it. I’m in love with that book and with your gorgeous space. Wonderful job!! Gorgeous!!! Every part of it is just beautiful! You were wonderfully inventive with the space too….love that! Beautiful garden! 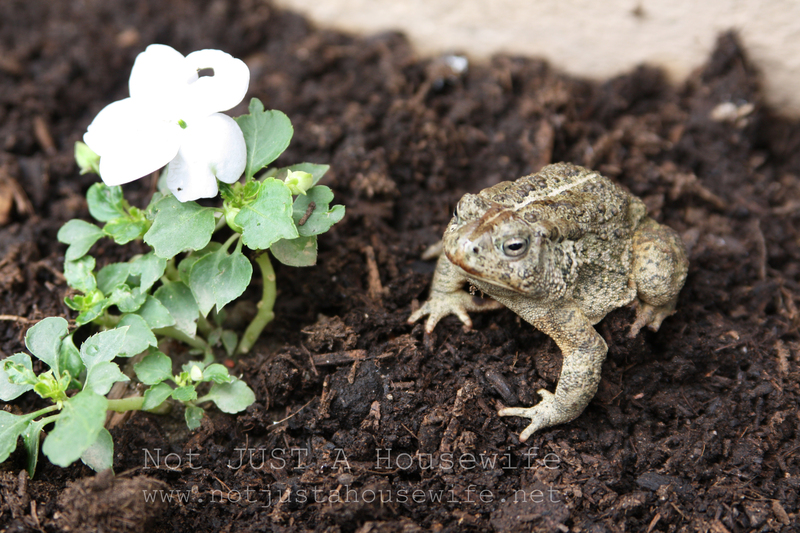 Toads are great because they eat bad bugs that ruin a garden. Thanks for sharing your secret garden. I was wondering what you were slaving over in your yard– looks amazing! 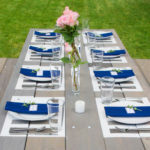 You are so going to be featured in bhg again! I love it!!! Absolutely enchanting :). Oh my gosh Stacy!!!! This is absolutely gorgeous! You have outdone yourself again. I would love to cozy up with a cup of coffee on that little bench. Everything is amazing Stacy! What a beautiful space. I always loved having secret places to read also. Love, love, love!! I really want to do this too. Which direction does your little garden face? Are you getting sun all day or some shade? I’m pinning this for sure! I am BLOWN away! How I would love to have a ‘secret garden’! Everything goes so well together, and I especially love the wall art with moss! There is so much to love about this space! It’s AWESOME! 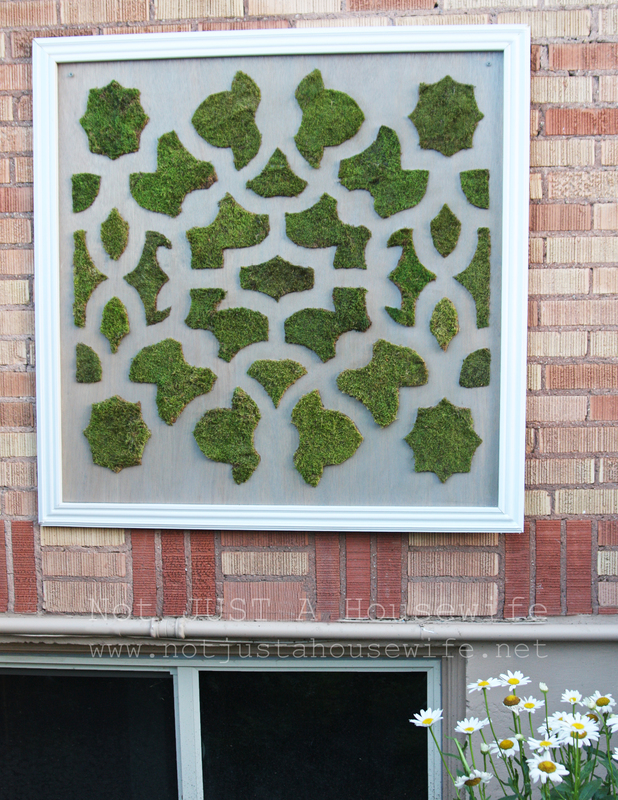 I especially like the moss art because I’m a vertical gardening freak but the whole space is just so special. Separated at birth — for sure. Favorite book? Mandy (in fact, last year I splurged and ordered an old copy with the beautiful watercolor cover on ebay), of course. Julie Edwards is Julie Andrews — you knew, right? Pretty sure a star today writing a book would make MUCH bigger waves. My next fave is definitely The Secret Garden, as much for the Tasha Tudor artwork my book had as for the story itself. And, obviously, the garden is beautiful. LOVE the mirror, it so makes it a real room! I love it! So beautiful. I could totally read a book in there. Eek!! I’m in love!!! Stacy, that is just fabulous!!! I dream of my back yard looking like that. I have a neighbor who is a breast cancer survivor and she has turned her entire back yard into a secret garden. She started gardening as a way of taking her mind off of her cancer and her treatments. It is so peaceful to sit out there. wowzers!! so nice! can’t wait to see how you made that moss art! LOVE IT! Absolutely beautiful! I have plans for my own secret garden too. I love that you went for it and just did it. Wow! It looks amazing!! I’d love to just sit out there! Great job! Wow. Just wow. You did an amazing job! So beautiful!! I love it all so much but I think my favorite part is how it’s so nostalgic for you! I have a few books from my childhood that I feel that way about (The Secret Garden is one of them! ), and this would just be so meaningful! Great job! You are AMAZING…you did such a fabulous job with the space…the moss, the mirror, the key, the flowers…..everything just came together beautifully you should be so proud of yourself! Well worth the 4 months of work! Stacy, I love it! Everything about it. Even the toad! What a Beautiful retreat you have created! Hope you enjoy many happy hours there! What a neat post about a sweet place to visit! That’s beautiful! someday I hope to make a beautiful outdoor room of my own. And I love The Secret Garden! One of my favorite books as well and you sure did capture it perfectly! Even the toads like it! Can’t wait for your moss art tutorial. LOVE IT! 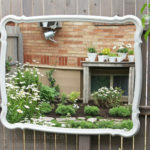 Never would have thought to hang a mirror in the garden, but it completely makes the space. What a super little hideaway. Great job! Um – I need to hire you to come do my house! Although, in KS, not much survives. Also, I LOVED Mandy when I was a kid and was pretty convinced I was the only person who’d ever read it. Glad to know there are others! I remember reading that book when I was a kid and loved it too! This space is amazing!!! 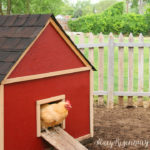 And I thought you were going to build a fort for your boys, instead you created a secret hide-out for the momma – way to go! I can’t believe how you transformed such a small area into something so magnificent…with all the points of interest tied together with the beautiful white flowers. How do you keep everything watered? (ie. did you put in an irrigation system, enough rainfall and/or native plants, or are you watering by hand? Absolutely amazing! Such a beautiful space! You did an amazing job transforming this into a beautiful and relaxing retreat. i love love love it!!! Can I move in with you?? what kind of tree is that in the corner behind your wedding basket? You did an amazing job move over yard crashers! Friend– I love The Secret Garden! I think the next time I come to Utah, I’m bringing this vintage dress I have that has lace, and a high neck and its cinched… you’re wearing it, sitting on the bench and having a photo shoot. I teared up thinking about all the daydreaming I did… thank you! Just beautiful. I love everything about it esp the mirror that looks like a picture! What a great idea. Thanks for sharing with us. I love this Stacey! Great job!! I totally loved the bookMandy as a little girl too. One of my very favorites!! Stunningly beautiful! Your details are just so amazing and different. 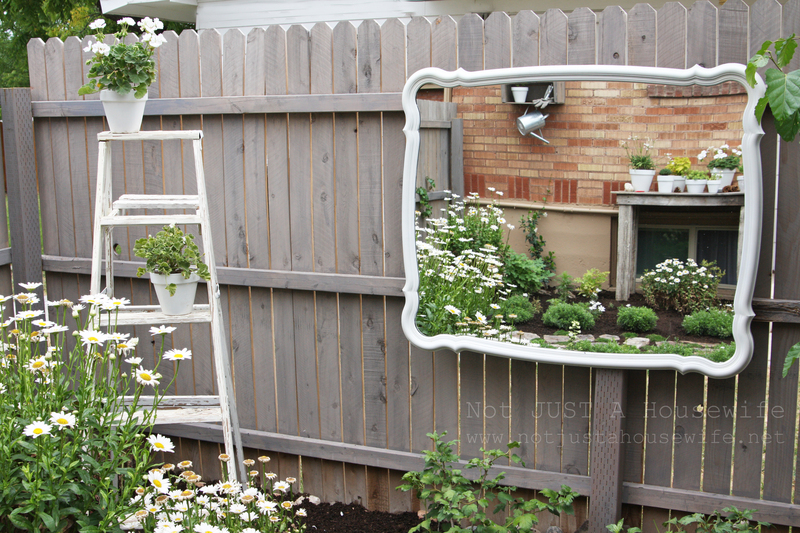 The mirror, ladder, lawn art… I can barely fathom the before being the same space! Beautifully done! The Secret Garden was my very, very favorite book growing up also The Boxcar Children. Friends and it is complete!! Very nice! 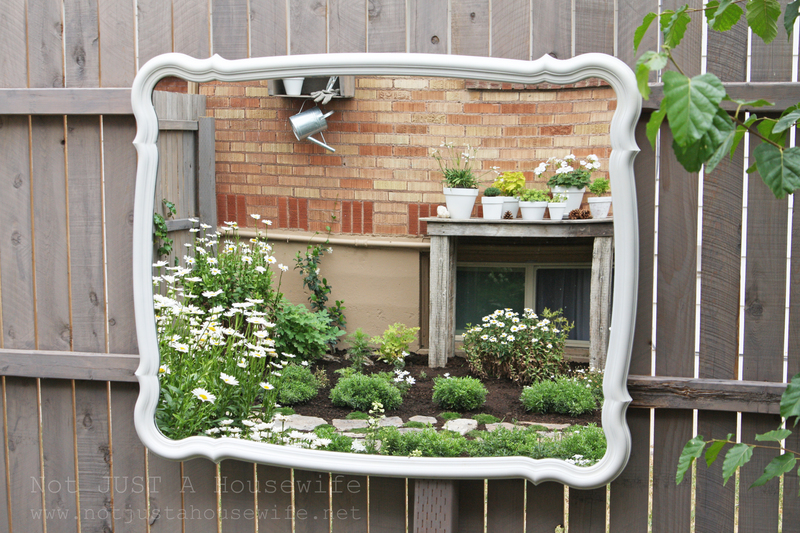 Love Love Love the garden mirror idea! This is jaw droppingly amazing! Wow! Absolutely gorgeous. I am seriously blown away. And I want a toad too! I love how you tell a little personal story with each item. It’s what really makes the space special. Great work! GORGEOUS!! Dying to see how you made that moss art! It is absolutely beautiful Stacy! I love it! I am beyond impressed with your magical secret garden! It is beautiful and inviting. All those white flowers and items will look lovely in the moonlight!! Very pretty Stacy! It turned out beautiful!! I know you will spend many relaxing hours there. I have looked at your post three times and see something different each time. It is amazing and beautiful. The key is the perfect touch. Love everything. I will view this post many times. Thanks for posting. I wish I had a place to so something similar. It’s beautiful in so many ways! Every single element is so special and it all comes together perfectly. I can’t pick my one favorite part because they are all lovely. Can’t wait to see the tutorials you have planned, especially for the moss art! Amazing!! you are killing me… I LOVE daisies and they do not grow well in Southern Utah. Not much does here other than rosemary, sagebrush and cactus anyway. I would love to have a pretty secret garden too but *sigh* not possible where I live. Sooo jealuous! Girl…………. You win YARD OF THE MONTH!!! This space you created is beautiful and is magazine worthy. Love those doors too!!! Oh my gosh Stacy, this is gorgeous!! You’ve outdone yourself. It’s AMAZING!! I love your secret garden. You did a marvelous job on it. So beautiful! Are you going to let it get all wild and overgrown like the original secret garden? I love my yards a bit wild…… I also have a “pet” toad or two here, I love talking to them (they don’t love it so much). LOVE the book, my daughter and I just watched the movie, and I LOVE your space. This is INCREDIBLE!!! I need to see it for myself!!! I have a few lil places in my yard I have wanted to do something like this in… You have oodles of talent and patience.. BRAVO!!!!! WOW is the only thing that can be said. Amazing job! I also loved The Secret Garden, and you certainly created a beautiful version for yourself. I rent, so I can’t do this, but your space turned out fantastic and I hope you enjoy it every time you look out on it, or sit in it. I loved the tad as well, and I think he was a sign or you! Wow! Gorgeous. So sweet and serene. Really captures the spirit of The Secret Garden. The toad is definitely a good omen. Love all the details. The lamp kills me. What a great idea. Love every inch of it. It is absolutely wonderful and will only get better with time! Congratulations on your new lovely space. I love toads too, your little guy is cute! oh my word that is bloody gorgeous. my mouth was dropped the whole time reading! you and I are more alike than you’ll ever know. 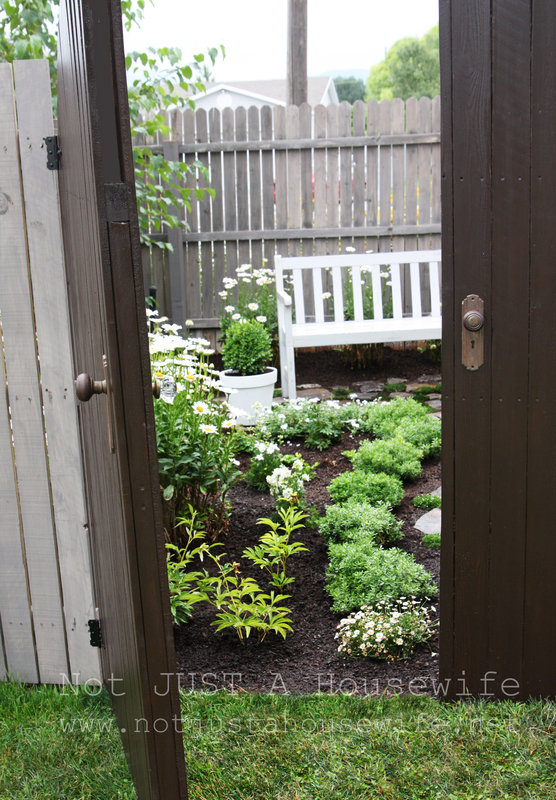 I created a “secret garden” for my children, because that was one of my favorite things as a child too, but it is seriously NOTHING like that! Just a bunch of big bushes they can hide in! LOL! WOW!! It looks soooooooooo gorgeous, stunning and beautiful!!! I love all the little details you have placed around like your little toad!!! This is amazing! I love it so much. i’m going to start pinning like crazy. Wow how positively darling and quaint. And yes, I am jealous that you can look at that while you work, especially considering the fact that I have not an ounce of green thumb in my body! I love the “indoor” effects you have like the mirror and lamp. Takes everything up to a whole new scale of sophistication. Oh, Stacy! I am on my way! 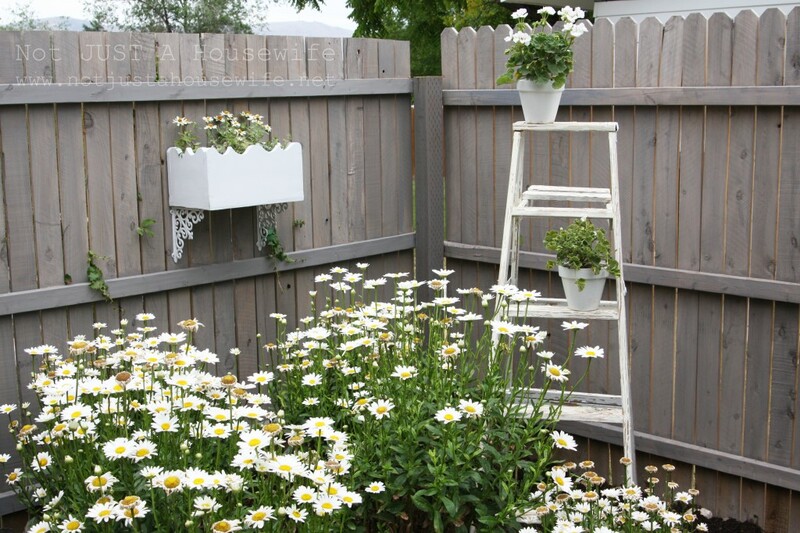 The daisies…the bench…THE MIRROR! I swoon. I have been looking forward to seeing this and it is amazing! Thank you for sharing your secret garden! Wow, that is beau-ti-ful!!!! Love it, you did a great job! wow, what a fabulous space. you’d never know that’s what is inside that gate. i love that you kept it just greens and white, so simple. let’s the space itself shine. Stacy, I am in complete awe! I’ve never seen such a garden. You are amazing! Its such a lovely space and as usual cost effective I love it! Love your garden! I have been planning a side garden (for the side of my house) for a while now, and your garden has given me some inspiration. Thanks! Stacy, oh my goodness! This is phenomenal! I love every square inch of your garden. Thanks for sharing and thanks for the inspiration. This is awesome! I have wanted a garden like thi, but I’m still not sure where it will “fit” in my yard. I love yours! Wow, your secret garden is Gorgeous! What an amazing transformation! Well done! Stacy! This is gorgeous! It looks like it came right out of a magazine!!! 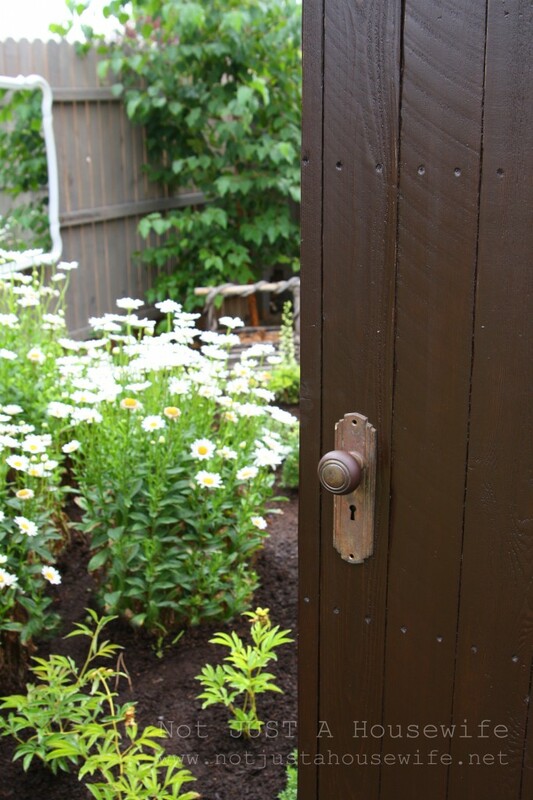 Your secret garden is lovely – I’d love to have one as well. 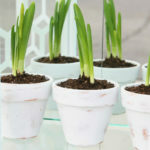 Will you plant bulbs this fall? I think it would look wonderful with tulips, daffodils and other spring flowers! Holy cow! Gorgeous garden! It is just so beautiful! You can tell so much thought was put into every little detail. Pretty, pretty. I love the Secret Garden. Man, I need to see if Netflix carries a version. Love your Secret Garden too. That moss art is to die for. Amazing! Enjoy!!! Perfect place to read a book and enjoy all the beautiful flowers. Thanks for sharing your space. Love your toad. They are very good luck-they keep pests out of our gardens and just look cool! 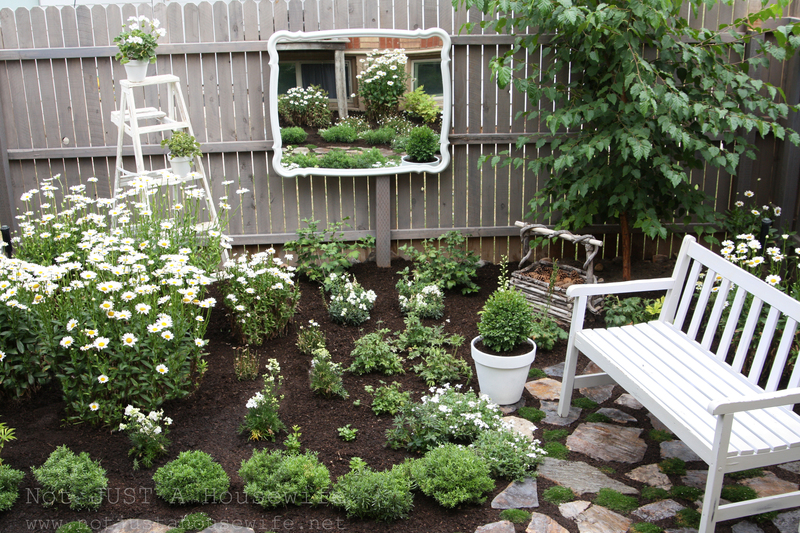 You did a gorgeous job on your hidden garden-especially the mirrors. Mirrors add such depth to a small space. Keep up the good work. very cute! this is the first post of yours i’ve ever read, but you’ve definetely got a new follower. This is absolutely adorable!!! GREAT JOB!!! This is too much! Too much! I can’t get over all the great things in your secret space. I just adore it. A solar powered lamp! So clever. The mirror – double the beauty! Yes, I am jealous of your office view. I have a garden path view at my office but it’s nothing like this gem. Thanks for sharing it. I just saw your feature over at the DIY Showoff and I knew I had to comment! It’s beautiful!!! I am currently working on a garden for my daughter. He name is Lily and it started off as a Lily Garden with only lilies (and one hydrangea, a gift the day she was born from my grandmother). It now includes other plants but we still call it our Lily Garden. 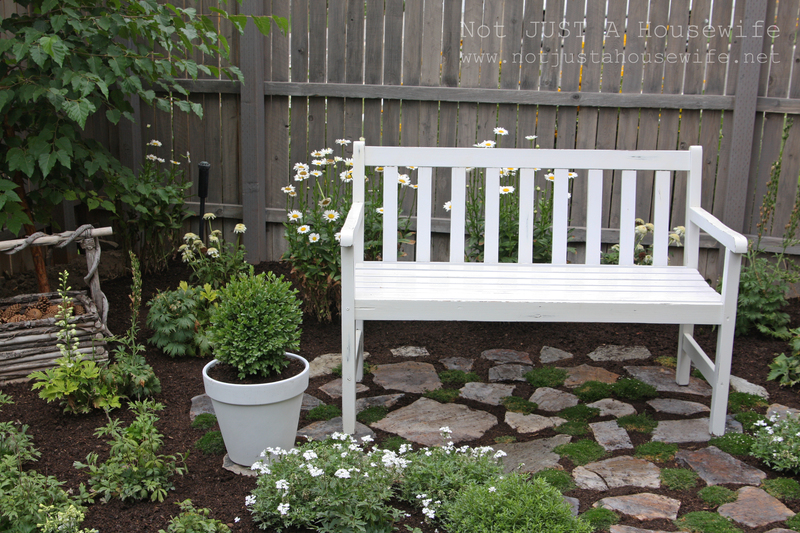 Here’s some of what we’ve done: http://thebrickbungalow.blogspot.com/p/lilys-garden.html I’m looking forward to fencing it in. 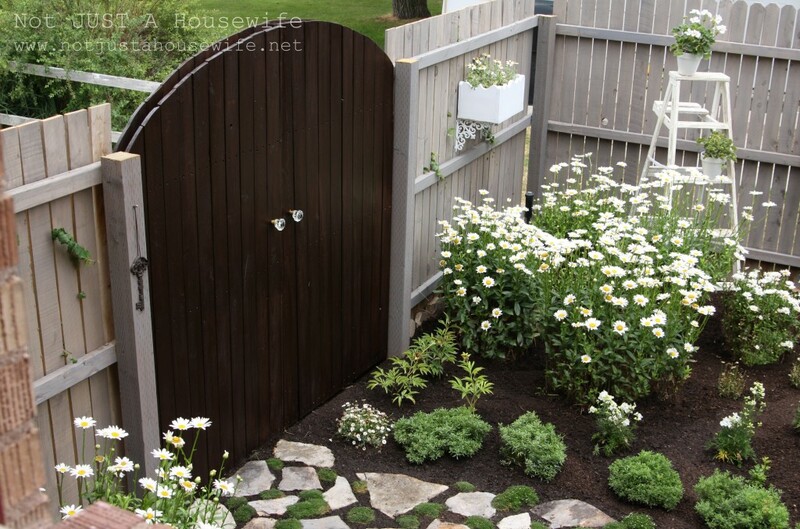 Your fence makes me want to do a privacy fence but I’m thinking of doing something more open too. It’s definitely a work in progress and I’m jealous yours has taken only 4 months! It looks great! Mine has been a work in progress for 4 summers now! Thanks for the inspiration!!! Oh, by the way, are you keeping it with all white flowers?! I’m curious because I’ve been into “Moon Gardens” and am planning on doing that in my front yard. OMG! That is absolutely gorgeous! I love the mirror and the shadow box on the wall, and of course the chair and the stone walkway. Simply amazing! It makes my garden an overgrown jungle. Which it has lots of great plants in it, but there are tons of weeds and no added embellishments. Except for a few plant containers. Here’s a thought for you too. 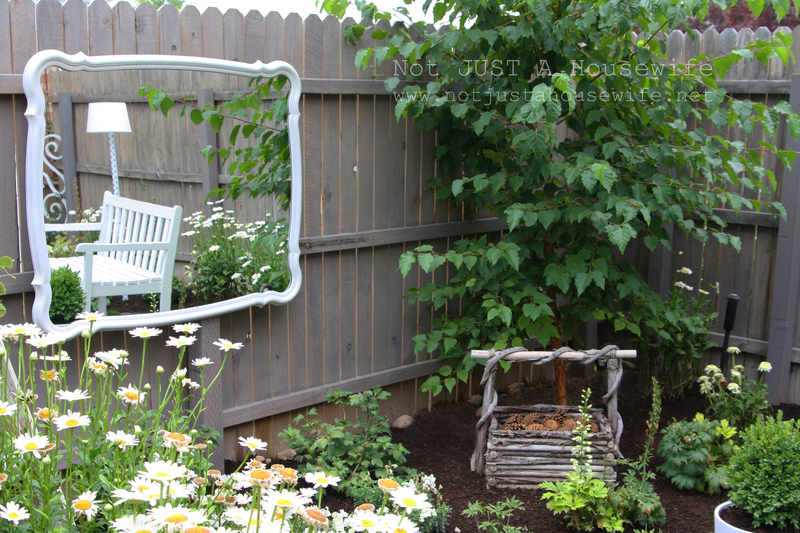 I photographed someone’s garden last summer and she had an antique metal headboard in her’s. Or an old antique tub could be another pretty idea. Food for thought. That garden is seriously amazing. It deserves a magazine article all to itself. You created an inviting, restful, beautiful space. I love it! Our summer has been so horribly hot and dry it’s been a terrible one for my garden….so glad I happened upon yours and got to enjoy how beautiful it is! What an incredibly charming garden! I love this space so much I can’t stand it. Can I come over and hang out with you there? I’ll bring treats! I love it! The mirror on the fence was a perfect touch. Wow!! I just spent about two hours reading your blog!!! I absolutely love your secret garden! 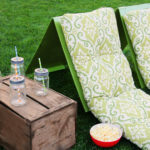 I found it and your blog on The Inspired Room blog! I will be visiting you now! Hope to win the Fish Foam!! This is a wonderful garden. It will only grow to be more beautiful. Small suggestion. That is a lovely basket from your wedding. Find something to put underneath to lift it off the ground because dampness will get into the wood and it will rot away quickly. Kudos for an amazing job. Wow Stacy, you have outdone yourself with this one! 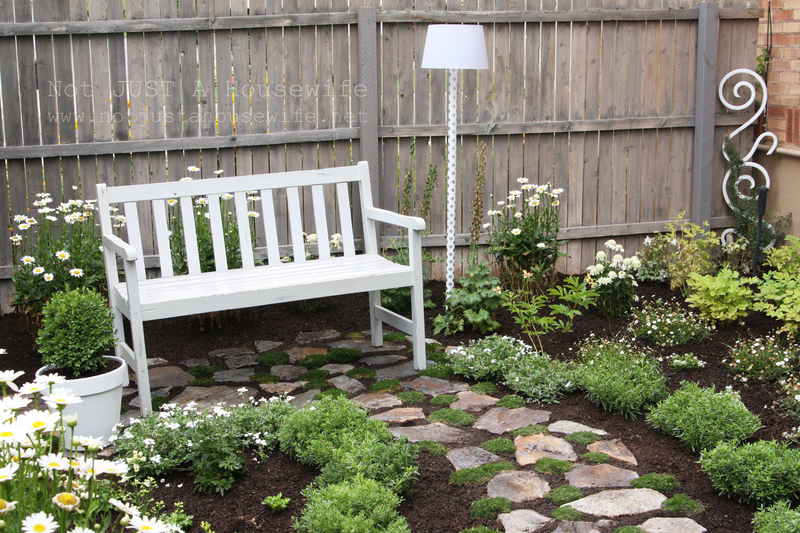 I love the flagstone path to the bench and how everything is perfectly pulled together to truly feel like another room. Lovely and peaceful. 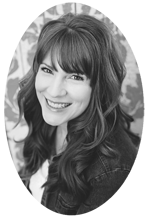 i found your blog through the inspired room and i must say i’m jealous! i am a huge fan of mandy and the secret garden books, too. i dreamt of having a little place all my own to fix up. you’ve done a fantastic job on your secret garden! so beautiful, love it. 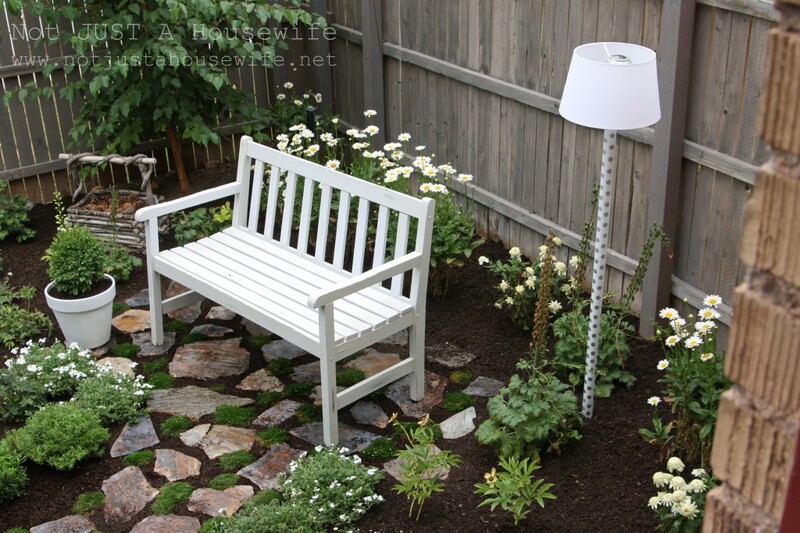 Is that a solar lamp by the bench? If not what about rain? Wow, Stacy. This is really nuts. So beautiful. I somehow missed it when you posted it. So loving that space. :) The moss art is SO great. What an ethereal space… I could lock myself away in there for hours! I well remember the days of trying to get projects done at night when I had little ones – you did a great job! How do you keep that many plants alive?! That’s amazing I love your little retreat! Oh my goodness, where have I been? The last little while has been so crazy that I missed this post! I love your secret garden! Someday I will have a house of my own where I can create my own special space. I’ve been cutting out magazine clippings of amazing gardens and outdoor spaces since I was in high school. Someday it will be reality! Hi Stacy! I love your “secret” garden. I found you through Pinterest, so it’s certainly not a secret anymore. I love all of your ideas and I will be stealing the key one . I started a video blog , if you go to my Pinterest Videos board or Screendoorgirl 3 on You Tube , check out my Fire Pit and Side Garden Tour. Hopefully I will have found and added my key by then. 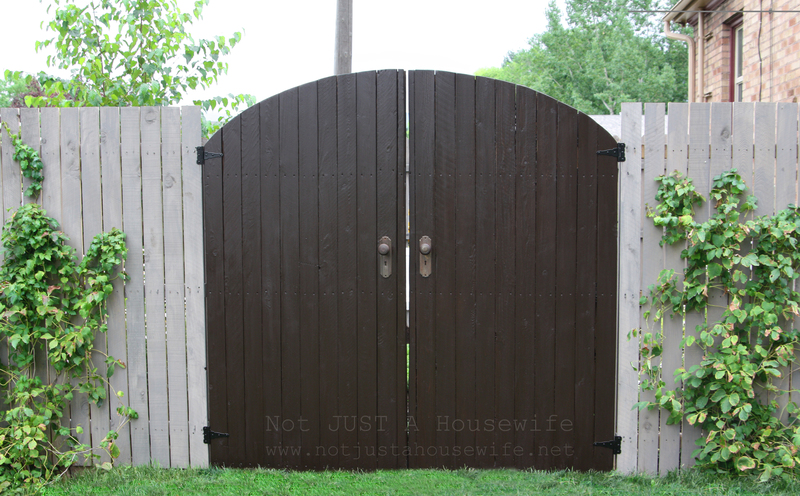 Do you recall the paint color of your gate? 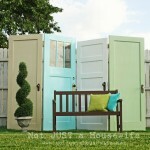 I want to paint my shed door a color like that. I share your love of moss and my next project is to fill a large crack in my driveway with it. Hope it works! Thanks for sharing ! 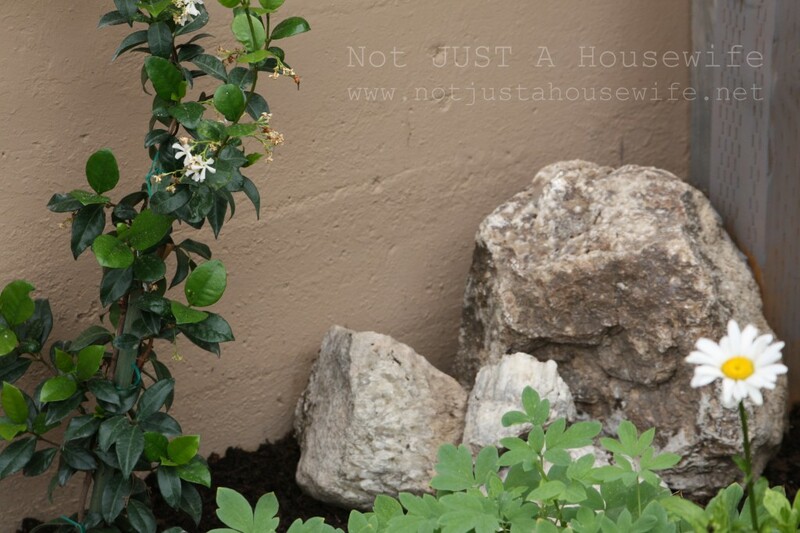 My name is Jodi…..
Love your little “Secret Garden” area. Looks like a very relaxing place to be. I have a small area that I’ve been wanting to do something with. I’ve been mentioning it to my husband off and on for several months now, he wonders why I want to do something since it’s a small space that not many people see~I always tell him it would be like a little secret garden tucked away. You’ve inspired me to give it some more thought on doing~not this year though, it will have to wait till next Spring to get started. But hey, that gives me a while to plan…plan…plan. Congrats on your feature from Beneath My Heart! Wow. Just stunning. Seriously you did all this yourself? Would love to know all the plant names that you used. Soooo beautiful. Cool and airy with all the white! Im going to show this to my husband and beg to do this same thing! Oh! You’re the first person I have met who knows “Mandy” by Julie Andrews Edwards. I love that book! I actually have a first edition of it in hardback. It’s the most wonderful book for little girls ever. You just became one of my fave peeps, just with that. Seriously. Amazing! I am so in love with this garden! This is what happens when creative people like yourself tap into there imagination! Way to go I am in LOVE! 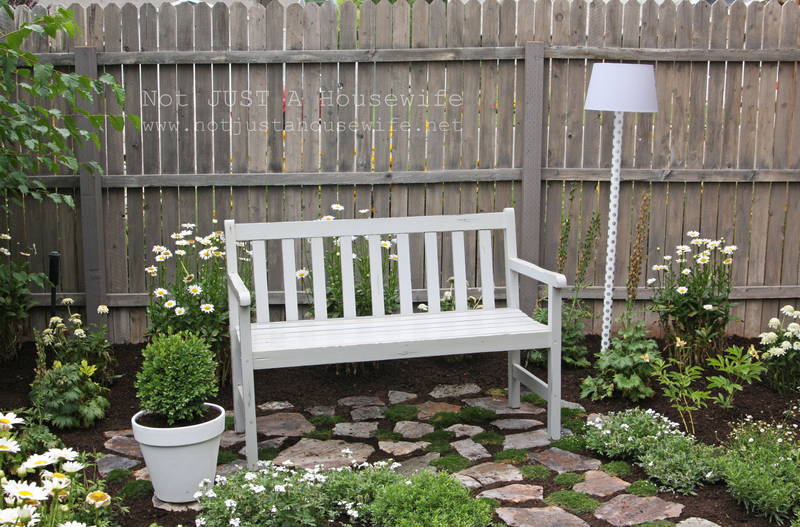 Absolutely love your garden space! You did a fabulous job. Thanks for sharing it. This is beautiful and so inspirational! I’m glad you posted the tutorials for I must check them out. I love your garden and can’t wait for spring to arrive so I can try a few of your ideas! I too have a thing for daisies- they were my wedding flowers. Just want to call attention to mirrors and the sun and how powerful that can be. You may end up being responsible for starting a fire so I would only add a mirror if it is on the north side of the house and in the shade. I personally had an experience of the sun shining in a south window and bouncing off a hand mirror on the bathroom counter and then to the tassel of my cosmetic bag zipper. The tassel started to smoke. I was shocked to witness what was happening and so thankful that I was there to move the mirror so my house didn’t start on fire. I also had an experience in the car when I was moving. I had a mirror in the backseat of the car and ended up having a hole burned in the head cover fabric of the car from the sun. Please be careful with mirrors! I rarely comment on blogs, but this is DROP DEAD gorgeous and clever. The creativity is simply amazing! I so love this! Thanks so much for sharing! This is simply AMAZING, INCREDIBLE, AND STUNNING! 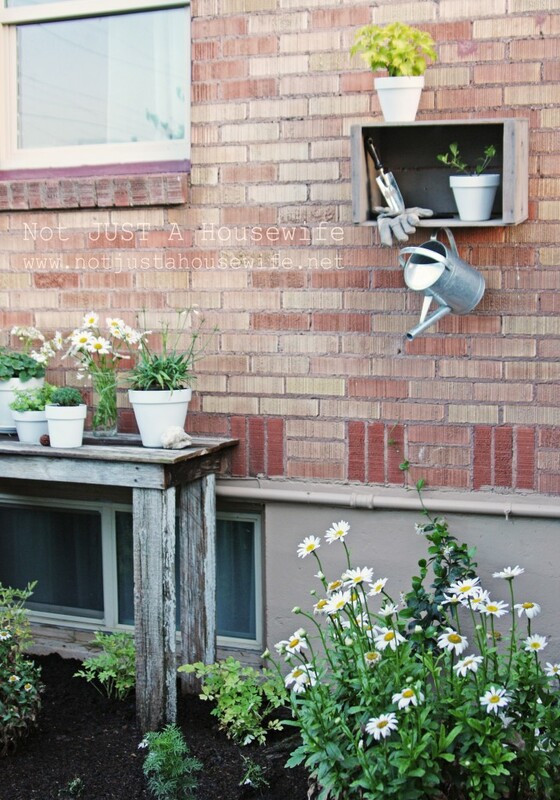 I have an old ladder that came with the house that I’ve always wanted to do something with outside. Now where is my white paint?! Could you please give a list of the plants that you planted, other than the daisies? I am already gathering for my spring/summer projects and your before looks much like my before. THANKS!! I am so in love with your garden. 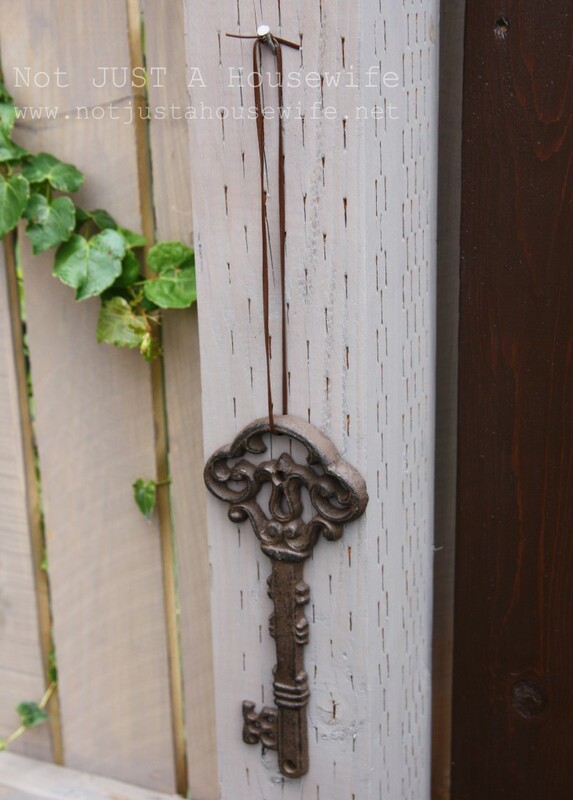 I need a key like that for my gate. I have the garden pinned and refer to it often, especially during January in New Jersey! Thanks for the joy it brings!! wow, that is so amazing! How do you keep it looking that tranquil with children? hahah… I love this, thank you for sharing! Muy Excellente! I think the mirror’s impact is clear in the photos – mostly it the white that shouts out though, the flowers, the bench and the stones. I like toads too, we have a little croaking frog here in my Oregon garden and although he is very noisy, I have yet to track him down. I don’t even know what color he is. Simply awesome. I love that book as well. Was Googling “Secret Garden”…..and came to this post. When reading the book….I could always IMAGINE iT!!!! Anyone who receives as many comments as you, needs a secret garden to escape to, just to read them all! Did you say four (4) children? Good heavens. You really did a beautiful job here! What a transformation! You have an amazing secret garden, I have been wanting to see how make one, you definitely gave me much tips. Thanks. Beautiful!!! I loved the secret garden book as well! I had to hop over here and comment from YHL’s site because Mandy is one of my favorite books ever! I kept my copy to give to my future daughter. I don’t know many people who have read it so I just got a kick out of seeing it in your post. Now, as a 27 year old, I feel the urge to read the book again! saw your site on YHL, I LOVED Mandy, it was cool to see that blast from the past book, I used to dream about finding a place like that for my own. Hope your secret garden provides you much peace, serenity and joy! What a lovely garden. I saw you over on Young House Love and just had to leave a comment. So glad they featured you. Congratulations! I love this garden so much but I agree with you. My favorite thing is the moss art. It livens up the space and gives it a bit of personality. Bravo! 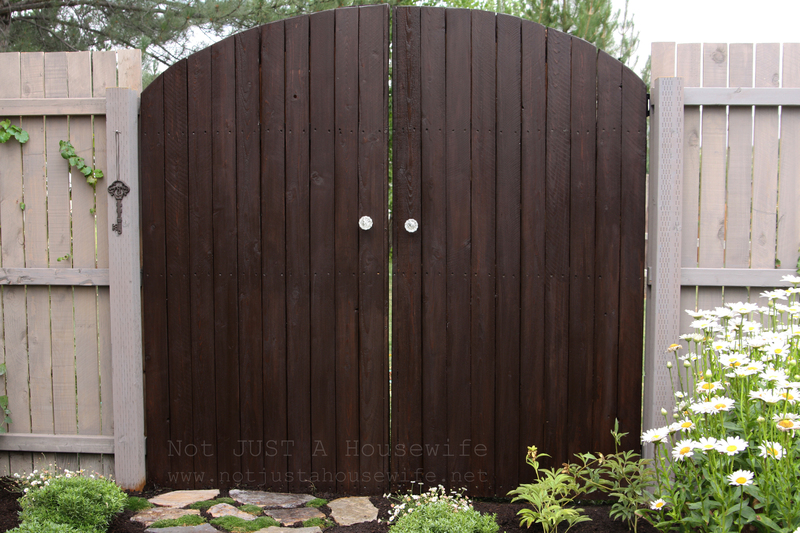 Can you tell me what wood the fence is made of and how did you refinish it? Is there a stain on it? 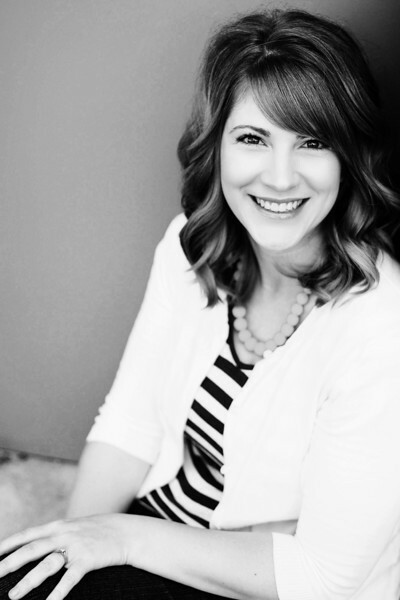 I loved this when you did and I was so happy to see it featured on YHL today. I hope you are seeing lots of traffic and gain lots of new followers. You deserve it! I love your garden. It’s inspiring to me. I am ready to get into mine, now. I LOVED Mandy! I didn’t think anyone else had read it! Lovely, charming personal secret space. Love the white and green. Really digging the moss art. WOW! 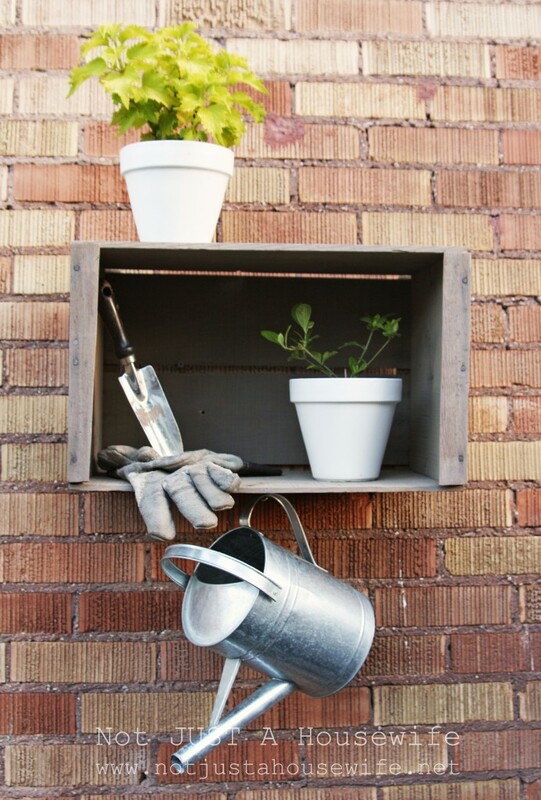 I have one suggestion for the garden tools – mailbox. They are not the cheapest thing in the hardware store (I was sorry to find out), but they do keep out the weather and most bugs. A mailbox would keep your garden gloves and tools dry if you forget to pull them inside before rainstorms. O.M.G. – I loved the book Mandy! How much do I still want my own little Shell Cottage in the woods, where no one can find me. What a beautiful little sanctuary you’ve created! 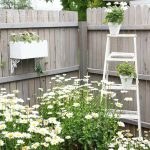 Your secret garden is amazing.I love the combination of white and green.In such a small space u created an awesome garden.superb. This is jaw-droppingly awesome and charming. It truly is a Secret Garden worthy of the book that bears its name. I recently cleared my hot mess of a backyard and this definitely gives me a lot of inspiration! Thanks for posting! Thanks so much for sharing your lovely garden. I finally found my secret garden key at Hobby Lobby. ($3.99 with 40% off!) . Anyway, your blog and secret garden are a lovely inspiration for me after this New Jersey winter! Thanks, and come on, Spring!! Any chance of updated shots once the plants had a chance to grow in to the space? Just found your blog. Love, love, love the mirror, the ladder, hanging boxes……well, everything!! Hello, I was wondering if you could tell me what kind of plants and flowers you used. Taller ones in the back look like lazy daisies and the smaller ones in the front look like boxwood, but I’m not sure. Thank you. My favorite little garden to date!! I love the style & simplicity /cozy feel. & that little toad…so cute. As a kid I raised frogs hehe love them both. Stacy! You are soooo Creative! I like you am a lover of the book “The Secret Garden!” I wonder if Burnett could have imagined how many would be inspired by her work(s)? :) With four children this is no small feat! My Daughter and Daughter N Law both have 5 children! I especially love the fact that you inspire many with your creativity in daring to dream with “normal yards” (not acres of rolling hills), to create a place to escape to dream, relax and reflect upon the many challenges that a Mother today (the MOST Important job ever), must endure. You have managed to create a space where dreams are made and have shared it with others! I pray your ideas and dreams will continue to blossom….. Your garden is so beautiful! 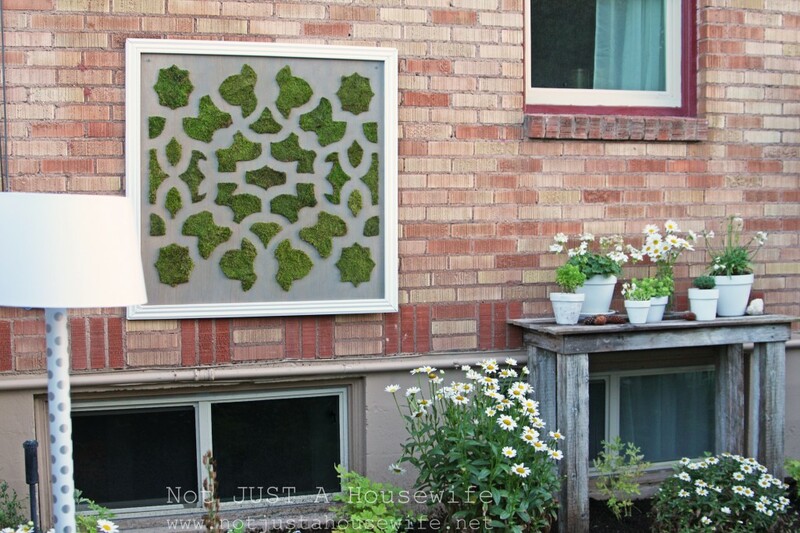 I would love to do something like this along the side of my condo in my backyard. May I ask how you dealt with the original ground? Did you have to till it or did you just pull everything up by hand? Also, is the covering mulch or dirt? I love your secret garden made my day!! Hi Stacy, how high did you go on your fence? It looks higher than 6 feet. 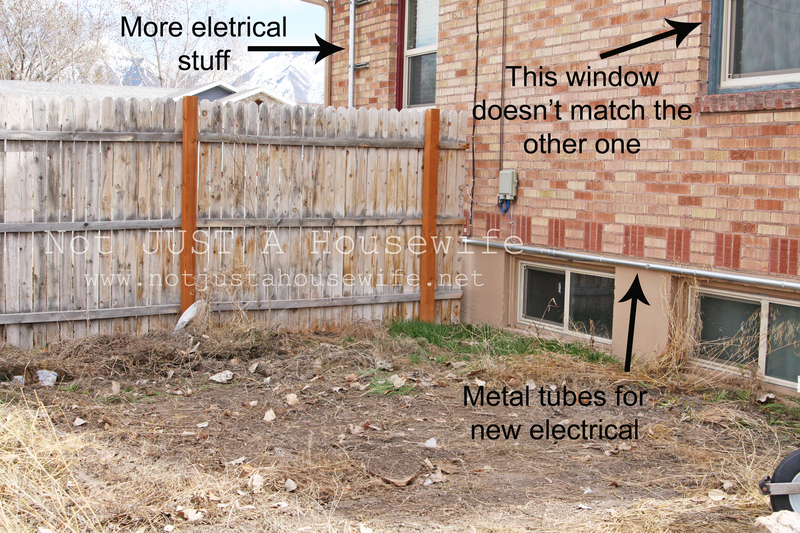 We’re getting ready to build a fence, and I want to copy what you’ve done! I am so stealing this idea for the northern part of our home that I did not know what to do in that space until now, thanks to you.